Update on mall building rates? US? Globally? Developing world? In 2016, global shopping center completions were up 11.4% over 2015 levels, despite having slowed over the past few years. The majority of added shopping center space came to market in Asia, but The Americas registered the strongest growth, with completion levels up 43.6%, fueled by construction growth in Mexico. 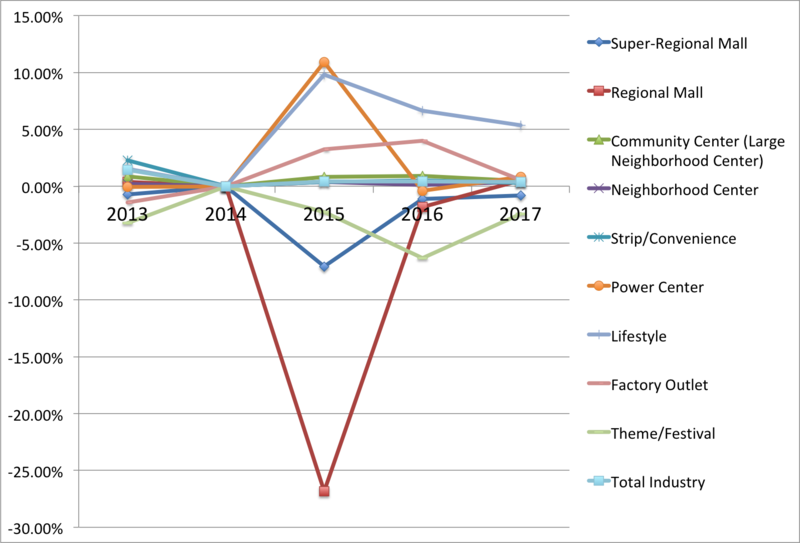 Global shopping centre completions started to slow (in 2015) as parts of the global retail market witness the effects of an imbalance between significant supply and demand. Despite this, there continues to be exceptional levels of construction, particularly in Asia. Globally, 10.7 million sq m of new space opened in 2015 in the 168 cities we surveyed; this is down on 2014, where 12.1 million sq m of space were completed; and a further 41.9 million sq m is under construction, up from 39 million in 2014. Discussion of the above CBRE report is available here. In 2016, European shopping center construction was down 6% overall compared with 2015. Western Europe saw an increase of 15% in new shopping center completions, but this was outweighed by a 17% decline in the UK, as well as a 17% decline in Central and Eastern Europe (which also dropped 11% in 2015). Further declines are expected in 2017. 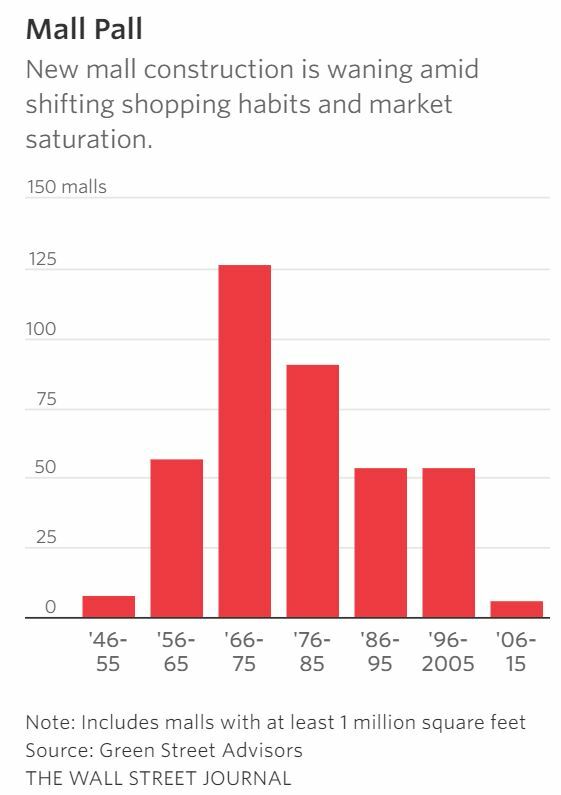 U.S. mall development peaked in the 1970s and has steadily declined. Just six large malls were built between 2006 and 2015, compared with 54 during the previous decade, according to Green Street. The oft-reported demise of the retail sector was another topic tackled by the panelists. But they were not ready to sign on to the prevailing attitude that retail is in steep decline. “Store growth continues on a net basis,” Ludgin said. The forecast found economists equally optimistic about the retail sector. Vacancy rates (see above) are expected to hold steady at about 10 percent for the next two years, while rental rate growth will decline from 2.7 percent to 2.0 percent in 2018—still above historic averages, the economists predict. Though the panelists agreed that many elements of the retail sector will continue to struggle—in particular, certain suburban malls—others will see an uptick, especially as the link grows between retail and distribution space. Retail space can play a key role in solving the “last mile” issue. Retail space linked to services and entertainment space is still performing well, Conway said. “What we’re not seeing is addition of shop space,” he said. Suburban malls will have to deal with obsolete space, but many retail spaces will evolve, as we “see the convergence of retail and industrial into one,” he said. Many online retailers, including Amazon, are starting to invest in brick-and-mortar space, Ludgin noted. And discount department stores “remain extremely viable and are still opening stores,” including chains like T.J. Maxx and Nordstrom Rack, which offer a value proposition. “As a nation, we still like department stores, and we still shop in them. It’s just that they are less in regional malls and more in open-air centers,” Ludgin said. CC’s calculation of growth based on ICSC data. See OF-charts.xls, “Shopping-Centers” tab. Similar in concept to regional malls, but offering more variety and assortment. General merchandise or fashion-oriented offerings. Typically, enclosed with inward-facing stores connected by a common walkway. Parking surrounds the outside perimeter. General merchandise or convenience- oriented offerings. Wider range of apparel and other soft goods offerings than neighborhood centers. The center is usually configured in a straight line as a strip, or may be laid out in an L or U shape, depending on the site and design. Attached row of stores or service outlets managed as a coherent retail entity, with on-site parking usually located in front of the stores. Open canopies may connect the store fronts, but a strip center does not have enclosed walkways linking the stores. A strip center may be configured in a straight line, or have an “L” or “U” shape. A convenience center is among the smallest of the centers, whose tenants provide a narrow mix of goods and personal services to a very limited trade area. Category-dominant anchors, including discount department stores, off-price stores, wholesale clubs, with only a few small tenants. Upscale national-chain specialty stores with dining and entertainment in an outdoor setting. Manufacturers’ and retailers’ outlet stores selling brandname goods at a discount. Leisure, tourist, retail and service-oriented offerings with entertainment as a unifying theme. Often located in urban areas, they may be adapted from older–sometimes historic–buildings and can be part of a mixed-use project. In 2015, 3.7 million square meters of shopping space was under construction in Chongqing — more than anywhere else in the world (and 10x the retail construction in New York). It’s also a much greater shopping stock than what’s found in China’s four first-tier cities (eg: Beijing, Shanghai) — more than 2 square meters per urban consumer, compared with 0.5sq.m in the first-tier cities. This is a problem because new demand has not been as strong as anticipated (as shoppers leapfrog stores and go directly online). The retail vacancy rate has been rising in many Chinese cities. Some department stores are reporting sharp losses, with some closing in the past year. Some retail developers are including entertainment (hotels, aquariums, sports hubs with rock-climbing, ziplines, indoor surfing, ski slopes) as well as shopping in hopes of staying ahead. [Chinese] ]Mall operators have responded to the ecommerce onslaught by reducing space devoted to retail and increasing allocations for restaurants, cinemas and outlets offering extracurricular classes for children. Electronics retailers have added in-store experiences and reallocated floorspace for ecommerce distribution. In 2016, Shanghai’s Joy City mall installed a gigantic Ferris wheel on its top floor to attract customers. Gome, an electronics store which is Chinas second largest brick-and-mortar retailer by sales, has added experience-enhancing elements in stores, such as virtual reality zones. It’s offline sales grew 10.5% in the first half of the year. buzz phrase in China’s retail sector, refers to retailers with large physical stores reinventing and transforming their business models and formats. Leveraging Internet, VR, AR etc to offer experience- and lifestyle-driven opportunities. Cewebrities are people who become famous on the Internet. Leveraging the power of their fans and social media, many cewebrities, especially fashion cewebrities, have set up online stores to sell fashion items. Some have even launched their own brands.